Voila! Here you have it! Three ingredient bread for souls like me who can't eat gluten, and, for everyone else who can because it is bloody awesome. Sweet potato, almond flour, egg. That's it. Simple. Clean. Delicious. I was vindicated. I showed the world. I came out on top again. Bah to all the bread. I got my own sandwich now bey****! You have probably heard this rant before, even from me. About food being increasingly commoditized and 'corn' being the poster child of the industrialization of agriculture. Oddly though, corn, for all its versatility of use, processed or otherwise, and villifaction, is not the most traded food commodity. As a grain, wheat and soybean rank higher in volumes traded. Yet, perhaps it is same versatility, and omniscience of it in its various form in pretty much every processed food, that lends to the sorcery of it. The irony here, as I have been finding out over the past week since I went on an elimination diet, is that corn has been the knight in shining armor in being a satisfying grain replacement. When I recently found out that I am wheat allergic, I cut it out for the most part. But, I don't know exactly what I am allergic to. Is it the grain, the flour or only processed versions of it? I don't know. And, I suspect that it isn't the only food that troubles me. One would automatically think to do a scientific test. Unfortunately, there is no single comprehensive allergy test that covers all the possible allergens. For example, I recently met someone who did the test because he was having reactions sometimes but did not know to what and the test came up negative. Only by a serendipitous allergic reaction, did he realize that he was allergic to sesame, a seed that is not normally tested for allergens. So, I figured the best thing to do, as with anything related to consumption of food, is to do it intuitively. The elimination diet was the way to go, for me. Instinctively, it has a scientific base of eliminating all possible and suspected allergens and bring the body back to feeling normal, the Control group. Then by introducing one item at a time individually, it is easy to identify the villian that causes issue and then work on eliminating it with confidence. So, in my case, I have eliminated all grains, except oats, dairy, except culture yogurt. So, this means, not only am I gluten free but all dairy free for the most part. Let me start by saying that I feel awesome! At this point, after a week, I have no gluten cravings. I even pass by the flakiest croissants with not even a second glance. It is of course opportune that it is Summer and the bounty of vegetables keeps my thrilled about my meals and satisfied. I eat a lot of fish and most often, protein with huge helping of vegetables stays me really well. However, there are times that I do miss something that a grain can offer. This is were corn comes in front, middle and back. 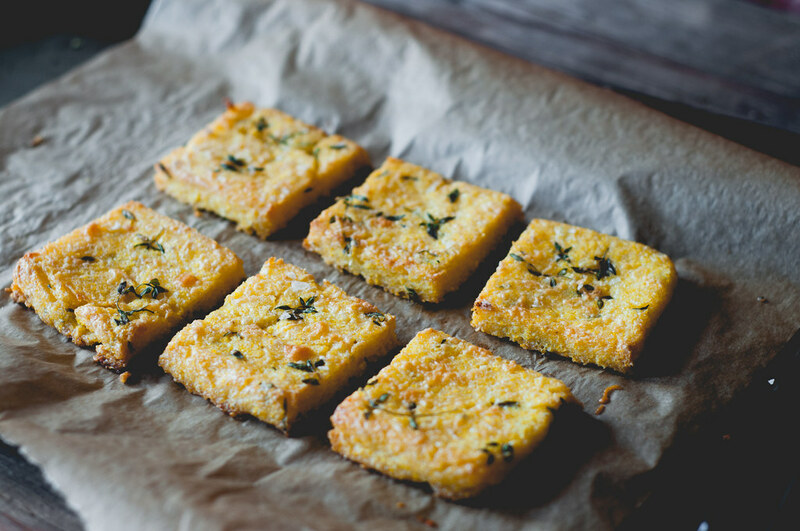 I have always been a fan of polenta and I am now eating it in more ways than before. It is my staple porridge like meal. I am baking it into bread, and I am scoring the web for more inspirations. Speaking on the subject of food inspirations, you know the thing is, as much as we, food bloggers, keep creating 'new' recipes, I feel, it is rarely entirely new. This is not something that as bloggers creating 'original' content, we acknowledge often. The reality is that sometime, somewhere in our countless hours of being plugged into the world of food, we come across a recipe that makes itself noticed and wedges itself into our sub-conscious. And, then at the opportune moment, it comes to the fore and gets 'originalised' with a little personalization or even a major overhaul. Nevertheless, the creative moment, I argue is not entirely unique to the current creator and that it is in someway always borrowed from either peer or history. Bring the almond milk and water to a boil. Add the corn meal and season the mixture. Cook until most of the liquid is absorbed and it looks the consistency of thick porridge. It should be thick enough to hold shape but not crumbly or dry. Whisk in 4 tablespoons of olive oil. Oil a 9x5 inch baking pan. Sprinkle half the thyme at the base. 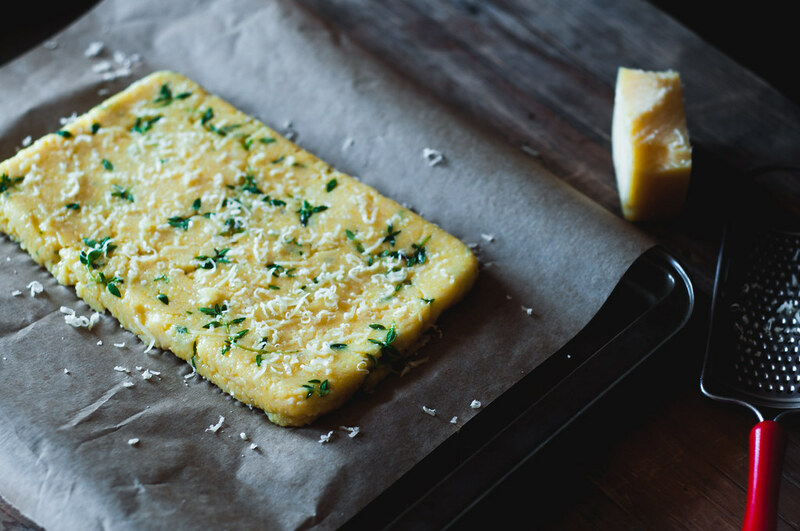 Spread the cooked polenta in an even layer and press in the remaining thyme on top. Invert the prepared corn cake onto a baking sheet and sprinkle the cheese on top. Slice into desired shapes and bake for 30-35 minutes until crisp and browned on top. Remove from oven and cool for at least 10 minutes. Meanwhile, in a bowl, whisk together the yogurt, 3 tablespoons of olive oil and salt. The oil will loosed the yogurt, making it spreadable and adding flavor. 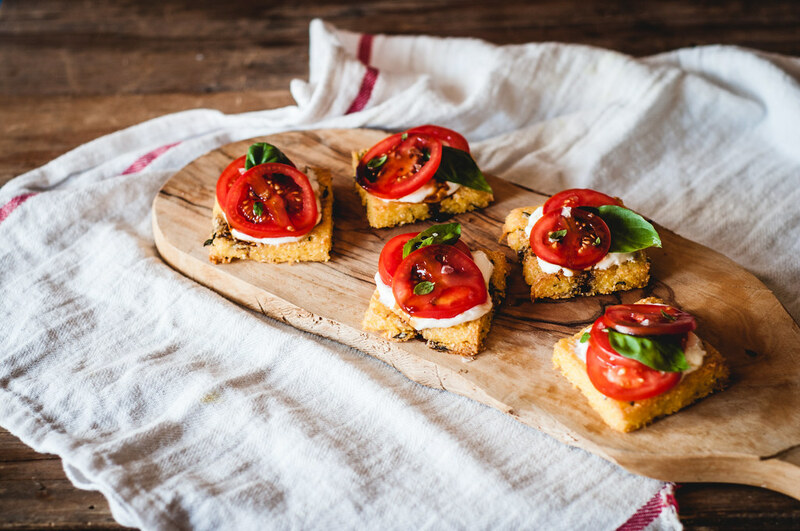 Spread each polenta flat bread slice generously with the savory yogurt. Top with tomato slices and basil. Just before serving drizzle olive oil and balsamic vinegar on top. It's been a wet couple of days in the North East. I had been away from my home and beloved kitchen for five days and returning yesterday night I was just overcome with relief and happiness. I don't know why.. I typically love travelling and have a constant itch for it. But, I suppose doing it every week is quite another story :) I just don't know how consultants do this packing-up-every-week-for-work thing! I think what I missed most, is the comfort of my kitchen and home cooked food even it be a simple Poha that I toss up for myself. The restaurant where Mr. FSK was put up was very fine, indeed, but then there is nevertheless, too much of a fine thing. After a couple of butter soaked, French Chef-ed dinners, I was about all ready for good ol' rice and dal! Btw, I have an abundance of zucchini in my fridge. I have made the usual suspects with them - tarts, breads. I am sure there are more ways to enjoy this summer vegetable! I would really welcome any other recipe suggestions you have for them. For more ideas on cooking fresh, seasonal produce, please click on the "Farm to Table Series" tab above. 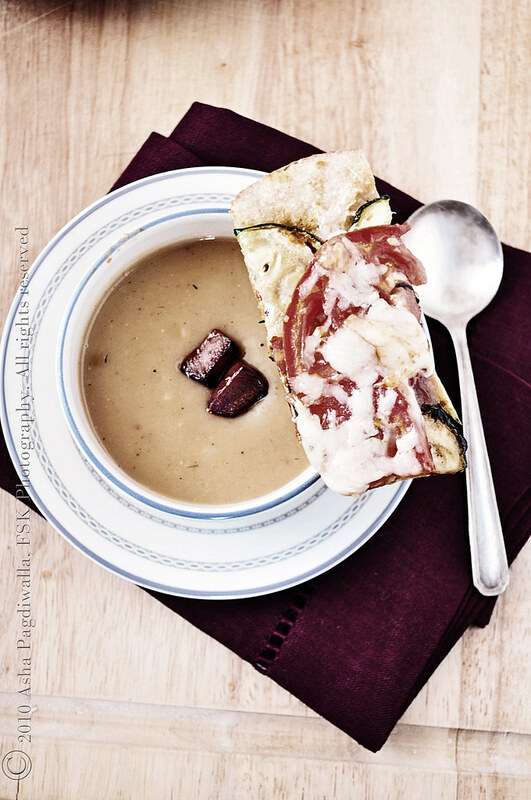 In a pan, saute the pancetta until the fat has rendered and the cubes are crispy. Reserve the cubes and leave the fat in the pan. To the hot fat, add the leeks, fennel and garlic and saute until soft. Add the potatoes and toss to coat with the leek and fat mixture. Add one cup of the stock, season and let cook until the potatoes are fully cooked. Proces the mixture to a puree and return to the stove top. Add the remaining stock and bring to a boil. Lower the heat and simmer for five more minutes. 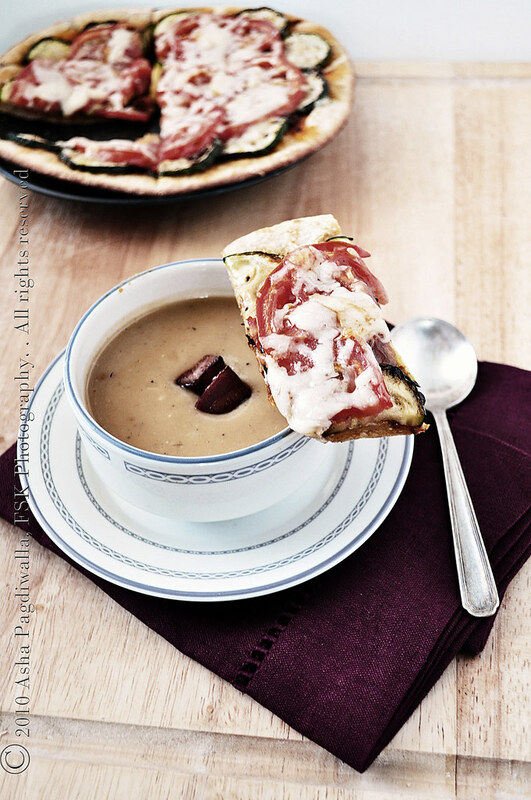 Serve garnished with reserved fried pancetta and parmesan cheese. Preheat the oven to 450 F. Lightly saute the zucchini and set aside. Roll out the dough to about 7 inches. Brush with olive oil. Spread the tomato chutney on the base, leaving a small 1/2 inch border. Arrange the sauteed zucchini around the base. 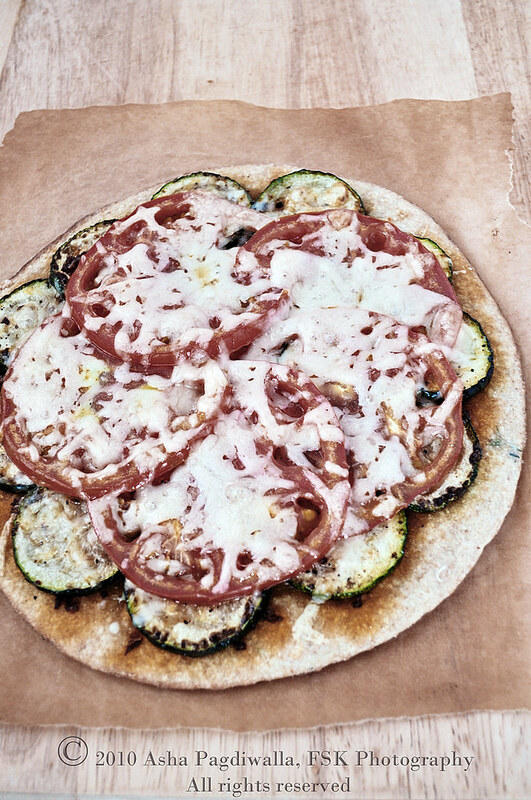 Follow with a layer of tomato slices. Bake for 5 minutes until the crust starts becoming golden. Since this is a really thin crust, it won't take long. So, keep an eye on it. Sprinkle the cheese over and return to the oven for a couple of minutes until the cheese has melted. Cool on rack for a couple of minutes, slice and serve as is or with soup. And, ofcourse I am sending this summery flat bread to Susan atYeastSpotting.